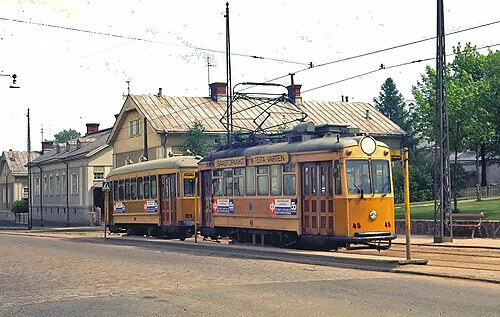 Urban tramways: (horse-drawn) 4 May 1890 - 31 Oct. 1892; (electric): 22 Dec. 1908 - 1 Oct. 1972. Lamb, M.V. & Wyse, W.J. 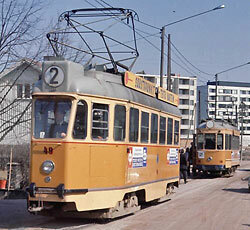 "The tramways of Turku (Åbo)", Modern Tramway, Apr. 1965 (28: 328), p.128-136. 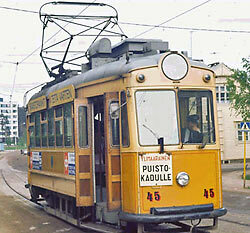 Laaksonen, M. Turun Raitiotiet - Abo sparvangers - Turku Tramways, Helsinki: Kustantaja Laaksonen, 2009. Also, thanks to Patrick Greifswald in Germany for information obtained through personal communication (e-mail, 16 March 2010).